Egusi is a seed that comes from a type of pumpkin/melon. It is usually in a yellowish-orange shell, which when cracked open, reveals a white seed. 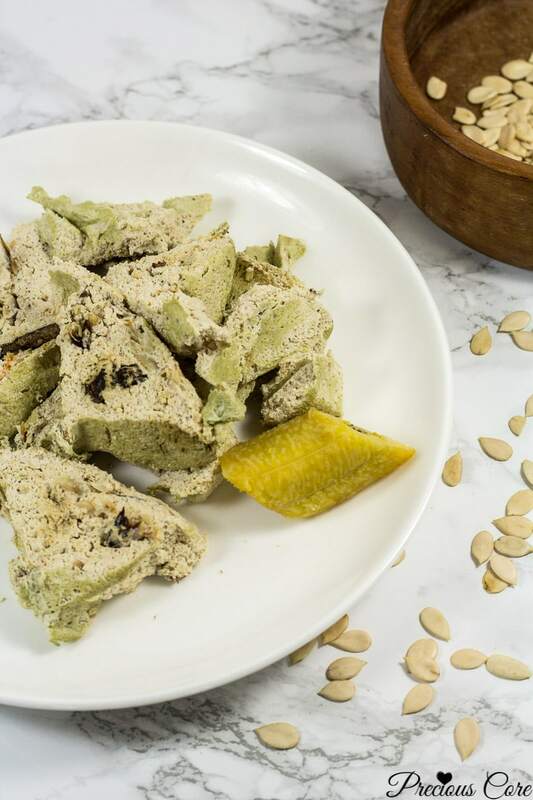 This highly valued seed, egusi is also known as melon seeds or pumpkin seeds. 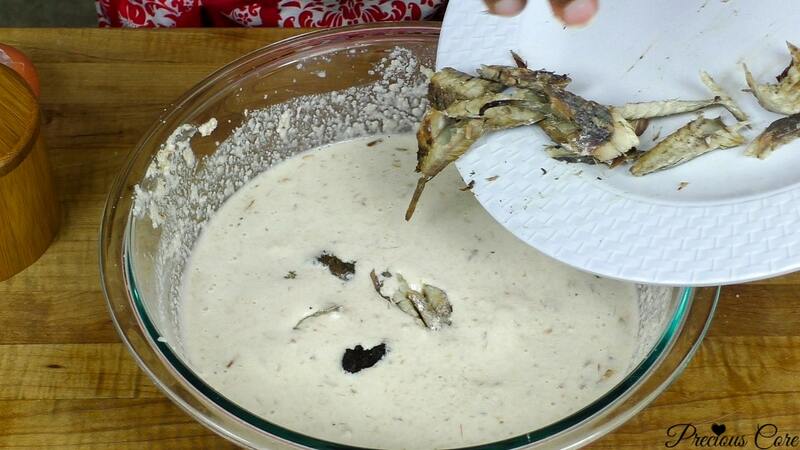 In some parts of Africa, egusi can be cooked with green leafy vegetables or used to make soups and stews. 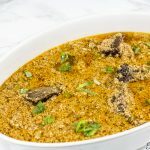 One of my all-time favourite Egusi dishes is the Nigerian Egusi soup cooked with sprinkles of bitterleaf and eaten with Eba or Poundo (Pounded Yam). However, Egusi Pudding remains top on my list. I could give an arm for a slice of Egusi Pudding… and I won’t be guilty because it is so healthy. Just look at those slices up there! African cake slices – airy, spicy, savoury and offering your taste buds all the good things they could ask for. 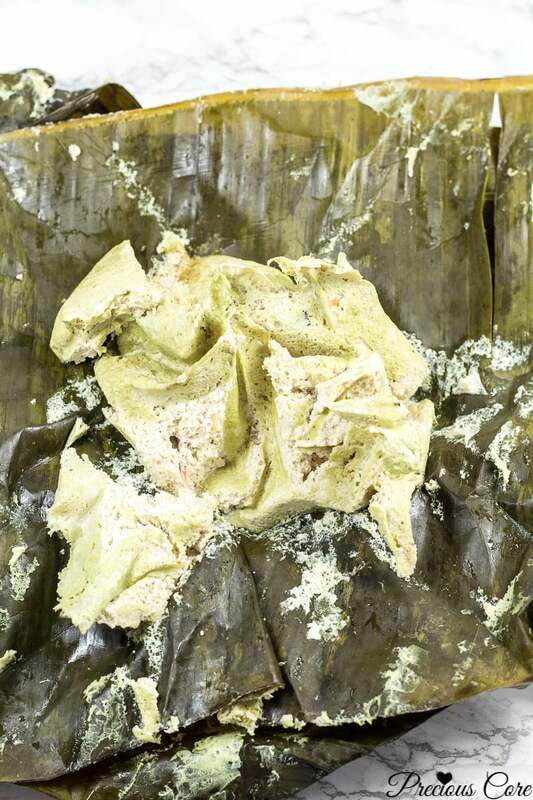 To make the pudding, the seeds are blended and mixed with water, fish, seasoning and cooked in plantain leaves or aluminium foil in the absence of plantain/banana leaves. Egusi pudding is usually a hit at Cameroonian parties! It is just so good! You can enjoy egusi pudding as it is or with any starchy side of choice. 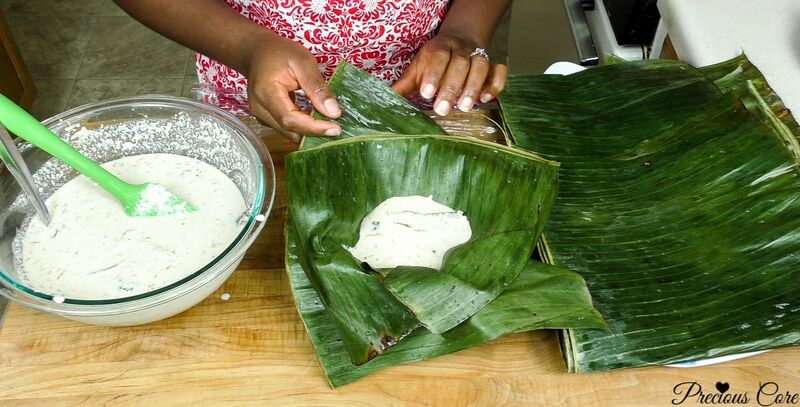 Options include boiled ripe plantains, boiled yams or bobolo/miondo (fermented and boiled cassava). I made a video to show you guys how to make this deliciousness. 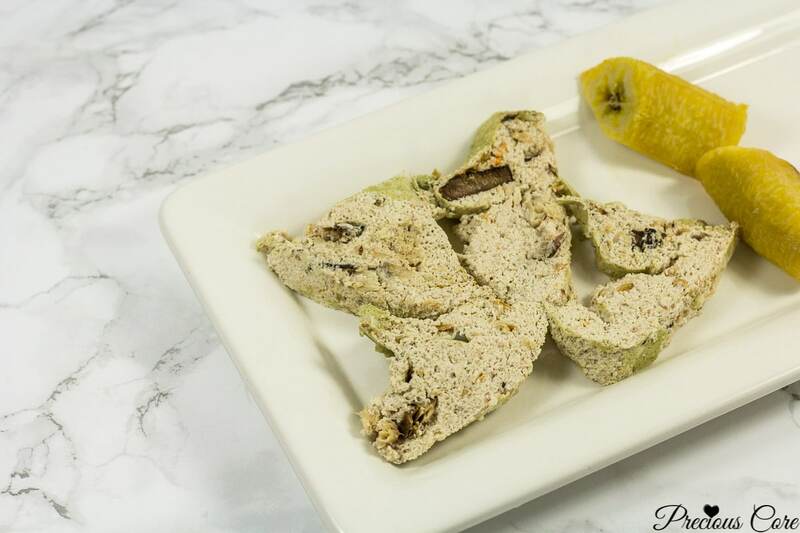 Watch the video below and check out the step-by-step printable recipe right after the video. 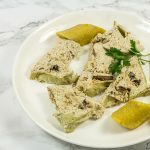 If you have not subscribed to my YouTube channel, click here to subscribe so you do not miss any of my cooking videos. Enjoy! 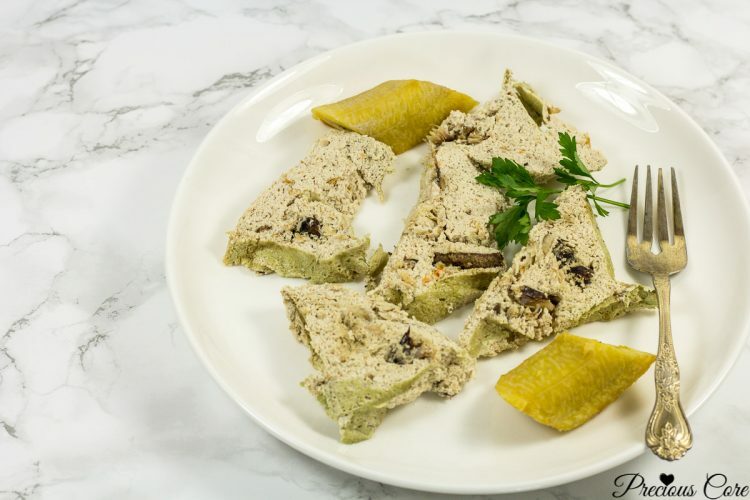 Egusi pudding is a savoury meal made with melon seeds and typically eaten in Cameroon, West Africa. 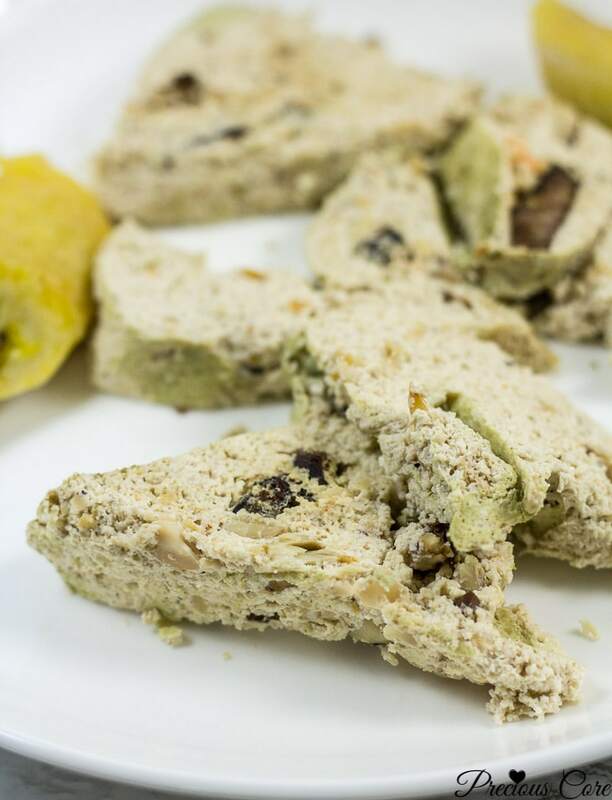 The seeds are blended, mixed with other ingredients and steamed. Insanely delicious! Put the seeds into a blender and grind. Please note that this is dry blending so you do not need to add water. I normally use the small compartment of my blender because it grinds seeds finely and doesn't leave me with an unevenly ground mixture. I blend a little at a time. 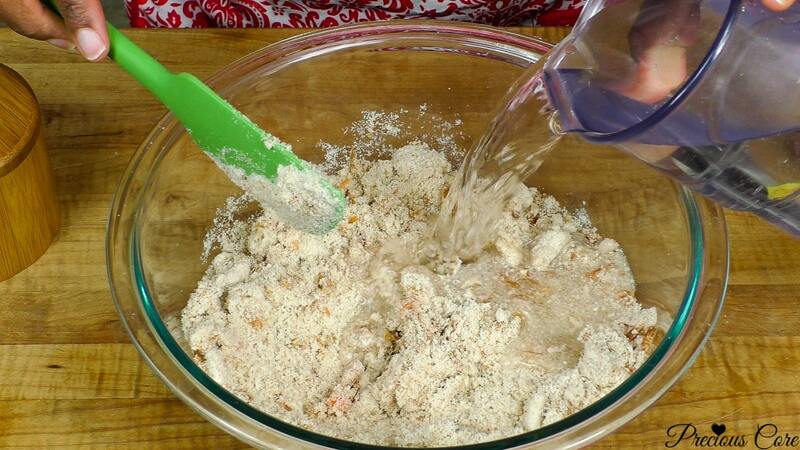 Add in three quarters of the water and mix into a smooth paste. 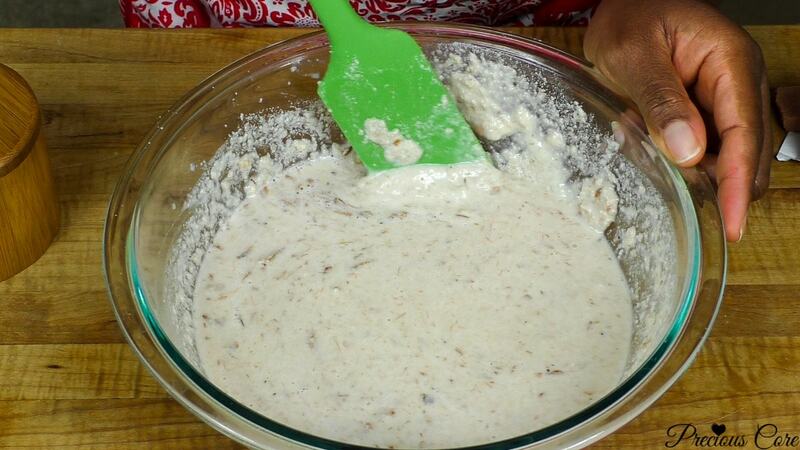 If you put in all the water at once, it may be very difficult to mix into a smooth paste. Add in the remaining water and mix well. 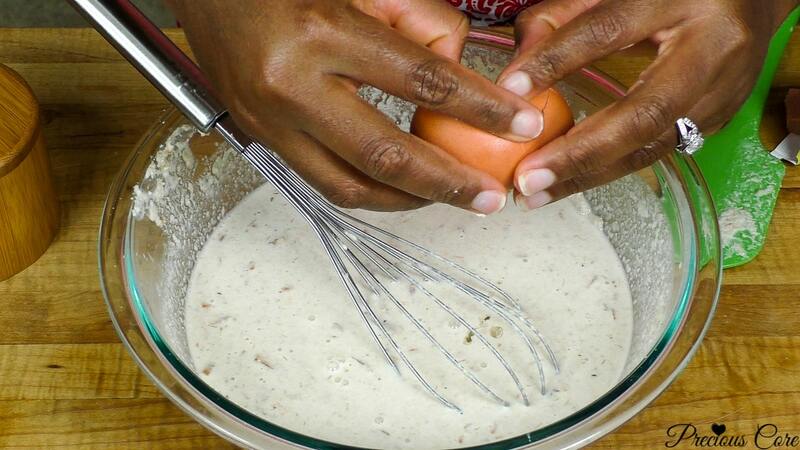 Add in your egg and mix well. 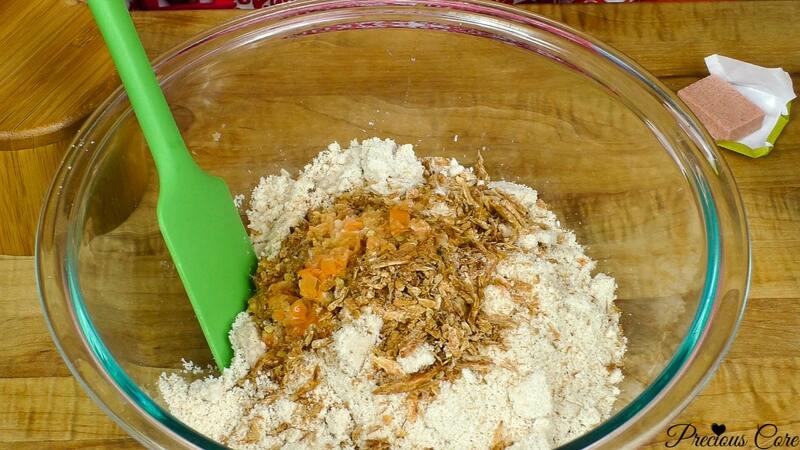 Add in your dry (or smoked fish) and shredded chicken (or beef) then stir to incorporate. 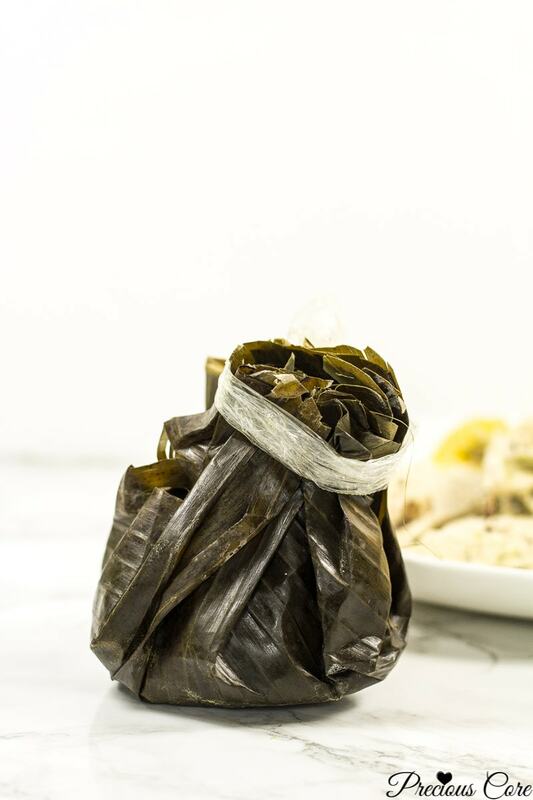 Line your pot with some banana leaves or aluminium foil to create a base for steaming. (Please see video for how I do this). Pour two cups of water into pot and place on medium heat. Place a banana leave into a deep bowl and push the centre to make sure it is indented. Add another banana leave across the banana leave. Pour two scoops (about 2 large ice cream scoops) of the mixture into the leaves. Gather together carefully to ensure mixture is secure then tie with a kitchen wrap or any plastic bag transformed into a tie. If using aluminium foil, you do not need to tie - just gather the ends of the foil together after pouring in your mixture and press to secure. Place every bundle into prepare pot. repeat process with the rest of the mixture. 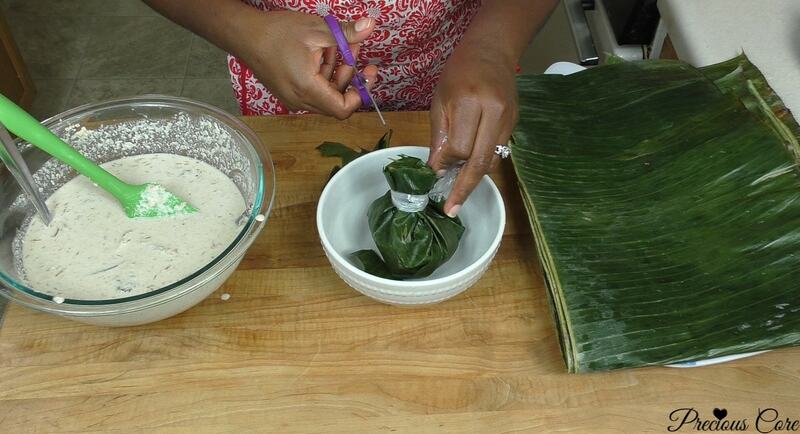 When done wrapping, cover all your bundles with another banana leaf or foil so the steam doesn't escape. Let it cook for about 60 minutes. Check to add water every 10 minutes so it doesn't burn burn. Be careful not to add a lot of water. You only need 1-2 cups at a time. After about an hour or more, your pudding should be ready. Remove, unwrap, and enjoy! You can enjoy as it is or with a boiled starchy side of choice. 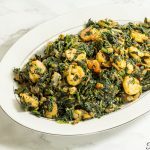 I love it with boiled ripe plantains! Boiled yams, cassava(yuca) or bobolo/miondo (steamed fermented cassava) are other good options. 1. If you are a ginger and garlic person, feel free to throw in a teaspoon of the blended spices. It doesn't hurt... rather helps to keep the doctors away. Wow am so gonna try this. Chai am salivating already. This is a whole new one, looks him. No be so? Thanks for the awesome feedback hun! 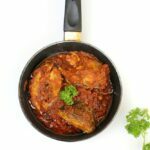 Precious, thank you so much for the recipe, am so gonna try it, wow. Awww you are welcome, Mariette. Thanks dear! Are you referring to parchment paper? I am cooking this recipe right now. Yay! Waiting for feedback, dear. Precious Precious Precious!!! That was 3 times ? So I FINALLY made your egusi paddy and gosh is it good!!! I used my Meat stock instead of water and I was lucky to find plantain leaves and that gave it that unique smell and taste that only plantain leaves can give. It is so yummy(as you usually say) that i had to eat and pick up all the small bits of egusi that squeezed between the leaves. This is my first time of making egusi pudding and it definitely wouldn’t be the last. Hahaha Marvis, you are so funny! Egusi pudding cooked in plantain leaves is life! Thanks for the feedback girl! This is so interesting looking. I have always associated egusi with soups,to think that it can be a pudding too. Nice one sis. Thank you, sis! The pudding is so good! Thanks so much Gerard! Yes, photography matters – so I can show how yummy the food is. Thank you! Wow, looks so good. I will have to try it over the weekend. Please let me know how it goes, Faith! woow,thanks PRECIOUS for this wonderful recipe. can i add oil to it? Yes you can if you so wish. Isn’t there a type of e pudding that is baked/roasted? Yes, sometimes I put in an oven safe bowl, cover with foil paper and bake. 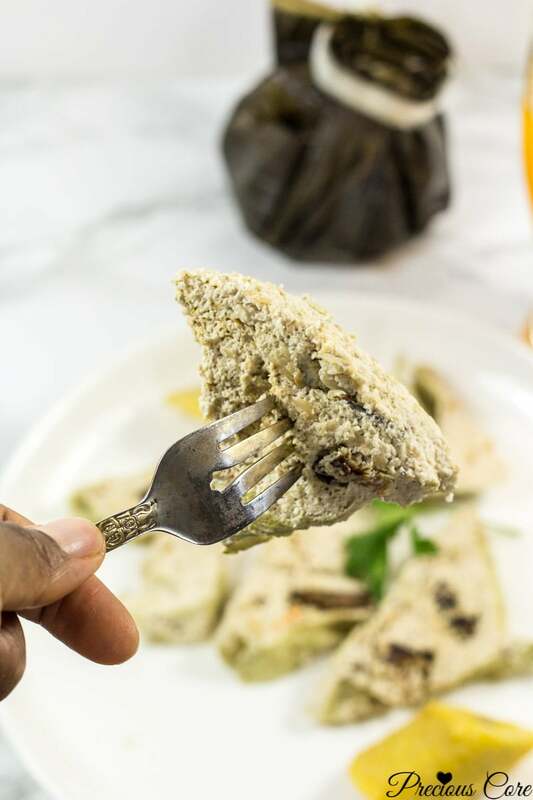 Also, sometimes already cooked egusi pudding is slightly grilled (while still in the leaves) to yield a nice smoky flavor and a crispy coating. Hi Claudia, yes you can totally wrap it in parchment paper. I have never tried it but I’ve seen pictures of egusi pudding cooked in parchment following my recipe. And it looked great! However, I will say reduce the liquid by half cup so it is not too runny. Hope this helps. I am speechless and grateful for this fine work. What brand of blender did you use? Hi Ebot, I use a Ninja blender. You can get it from amazon.com. 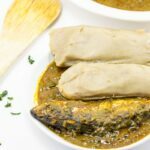 Please can one use green egusi? Yes you can, dear. It might look a little green but that’s okay. Love your presentation. l would like to purchase the blender. It’s a great blender, Aisha! It is called a Ninja and you can get it from amazon.com. Hi Barbie, using foil is quite easy. First, make sure you use high-quality foil – one that is thick and doesn’t break easily. Cut the foil into large rectangles and wrap your egusi pudding mixture in it. Double the foil so in case of any leaks you have extra coverage. Hope this helps.